Stay informed of the latest company news, product releases, and musings on education policy and technology by subscribing to the MyloWrites blog. Charity Thompson is an educator and recent Elementary and Special Education graduate from NYU Steinhardt. For students struggling with writing, it is far too easy for the narrative to become “I am my weakness, I am my struggle.” When students are not able to successfully communicate their ideas or meet their teachers expectations, it is imperative that students gain the ability to distinguish between a) the struggle they are facing and b) their sense of self. As educators, we need to help children develop a more expansive and inclusive narrative beyond their weaknesses; a narrative rather to their passions and strengths. These student passions, both personal and varied, will fuel their progress through their areas of struggle. However, research shows motivation cannot be outwardly manufactured. Any external sources of motivation need to resonate with a student’s internal drive and imagination, and teachers can play a role in helping a child explore the things that ignite them intrinsically. “When students are unable to communicate their ideas and meet teacher expectation, that anxiety, worry, and anger becomes central to the writing process,” Alice explains. It was insightful to learn that the student’s emotional levels affect the fluency with which they are able to share their ideas and communicate effectively. Another hurdle students face on top of learning how to access and translate their ideas onto the page is learning how to respond if they feel they don’t have any ideas at all. As educators, we have the ability to imagine a student’s experience and offer an entry point and scaffolding that will lead them to the next step. This will help the child feel secure and engaged as they consider their ideas. A strong teacher presence and support reduces the anxiety a student’s might feel about their work. One of the most important lessons a student needs to learn is that simply, writing IS designed for them to succeed in. As students begin to recognize specific portions or steps of the project that are challenging to them, they discover that entire writing process is not ALL impossible. As they explore writing prompts and stories that tap into their interests, students find they are eager to communicate their ideas and feelings. There is immense power and value in the sharing these sentiments and it allows students to connect more deeply to an receptive and eager listening audience. As educators, we want kids to understand themselves and be able to communicate their experiences in their world. This starts with recognizing that the learning process happens differently for each child. As we value each student’s unique response and work to scaffold their writing to higher levels of effectiveness, students become able to share their ideas and feel valued and heard in their worlds. And isn’t that ultimately the point of writing? A big thanks to Alice, Mya and Brian for exploring these challenging ideas and sharing their insights! MyloWrites Reading List: Why is Writing Hard? What we’re learning about this month: Why is writing to hard? Our team investigates “why is writing so hard?”. We gathered quick-and-resourceful reads will enlighten you on this question. Quotes from the article: "Rather than expecting students to put all these skills together, we must consider how to break them up, practise them effectively and gradually combine them – on the journey of developing writing." Know more resources on why writing it so hard? Share it in the comments below! What do you mean “innovate”? “Innovation” is a word we hear often today in education, but what does it actually mean? Researchers at local universities had figured out how to make incredible improvements to farming methods, but farmers weren’t willing to try them. That grad student was determined to discover the reason. Dr. Everett Rodgers would eventually succeed and become the father of the science of innovation. People don’t trust you to tell them what will work in their life unless you are living it yourself. In any group there are always a few experimenters, people will try just about anything. Most of those experiments don’t work. But when they do, these experimenters would show them off to their peers. 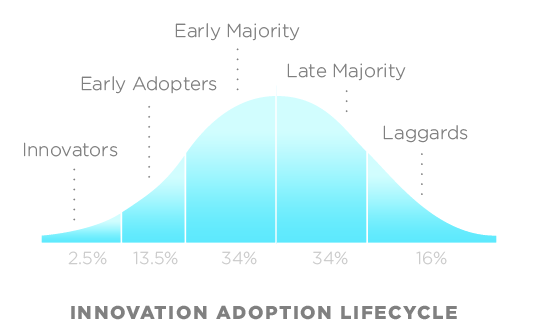 He named these experimenters “Early Adopters.” Once an Early Adopter proved something worked almost everyone else would adopt it over time. To Dr. Rodgers the Early Adopters were the Innovators - the people actually changed the behavior of the group. He later revised his theory to define Innovators as the people who tried ideas first. In education we often talk about improving performance, looking for ideas that are better. Yet when it comes to trying new ideas in a school, especially if it involves technology, almost everyone is affected: teachers, administrators, leaders, parents and students. Faculty must think holistically about the school’s curriculum and the tools they use in the classroom. While every school manages this need differently, the culture of academia is one of deference - we don’t want to impose our ideas on someone else’s classroom. This leads to a dilemma for Innovators. They want to experiment, but the path to implementation is uncertain. Can they just try something on their own? Should everyone else get a vote? What if another faculty member doesn’t feel like it will work in their classroom? Every step here makes good sense, but the process breaks down on step 4. When we bring the entire faculty in to evaluate a new idea they naturally do so from whether or not they would want to use it in their own classroom. Inevitably at least one faculty member will not be sure it is worth their time or meet a need that they have. While many Innovators persist through this pushback and eventually get a pilot it creates unnecessary friction. His point in making this graph was that you can’t expect the whole group to want to try something upfront. In fact, most of the group won’t try something until someone else has proven it. That’s why it’s important for school leaders and faculty to make a choice upfront on whether or not they will support Innovators in running experiments - regardless of whether or not it would make sense for the whole school to sign up. Every vendor has a story about how their product has worked great at another school. Yet most schools have learned that they need to test every product for themselves. Because the reality is that not every experiment will succeed. That’s too much change for an entire school to manage. When we empower the Innovators at our school to run experiments, we empower everyone, including the faculty who are willing to try a new idea once someone else in the school has proven that it works. Adopting new ideas takes time. Some find it harder than others to adopt new ideas and that difficulty deserves our respect as a community. This is perhaps the point I most admire about Dr. Rodgers. While we glorify the Innovators today in education, he was quick to point out that the resistance of the group to change prevents a lot of wasted energy. All of us have a valuable role in the path to discovering and testing new ideas. By empowering our Innovators to run experiments, we give them the opportunity to demonstrate the leadership potential they possess. We also show the respect every teacher deserves - that changes to their classroom should be made, to the greatest extent possible, when it makes sense to them to do it.